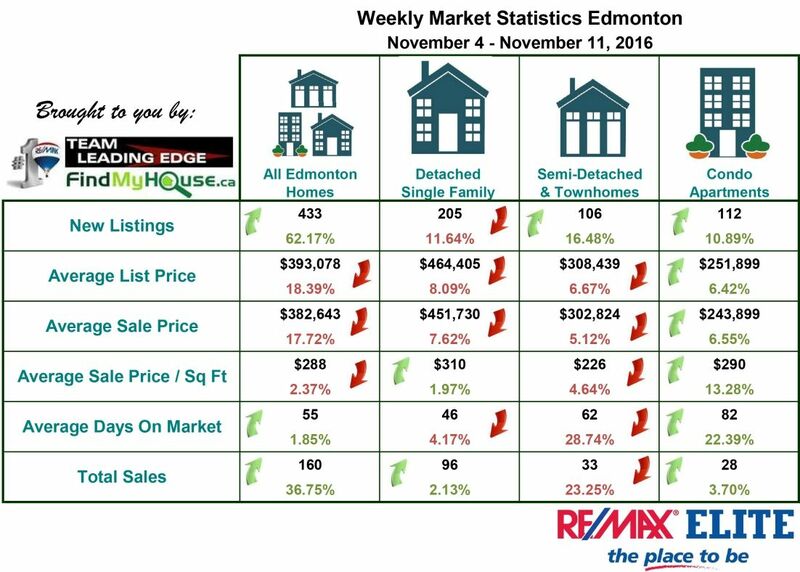 Team Leading Edge tracks Edmonton's real estate market on a weekly basis to provide credible information for sellers, buyers and investors. Found 43 blog entries about Edmonton Real Estate Market Weekly Update. Tuesday, August 1st, 2017 at 6:55pm. Here's this Wednesday's Edmonton Mortgage Rates. We welcome the month of August with the Edmonton Mortgage Rates remaining untouched, take this opportunity to finally buy that Edmonton house you always dreamed of! Let our partner Chita Metcalfe of Edmonton Mortgage Source help you finance that purchase. Tuesday, July 4th, 2017 at 8:10pm. We enter the month of July with the rates remaining unchanged giving you the opportunity to buy that Edmonton dream home. If you decide to finally buy that Edmonton dream home, you can expect help from Chita Metcalfe of Edmonton Mortgage Source, in financing your home. Tuesday, June 13th, 2017 at 7:49pm. The rates remain unchanged as we go through the 2nd week of June. Are you finally ready to buy that dream Edmonton home of yours? If yes, let our partner Chita Metcalfe of Edmonton Mortgage Source help you finance that purchase. Wednesday, June 7th, 2017 at 12:01am. 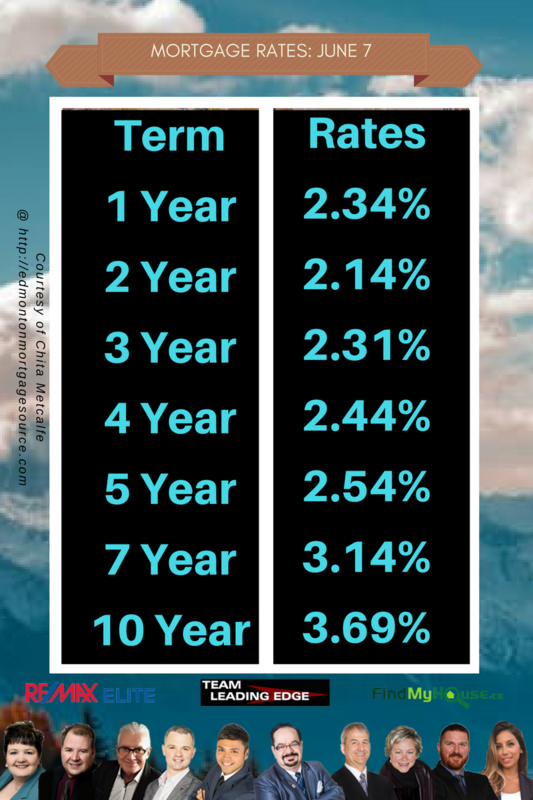 We enter the month of June with 3 rates going lower and 4 rates unchanged. 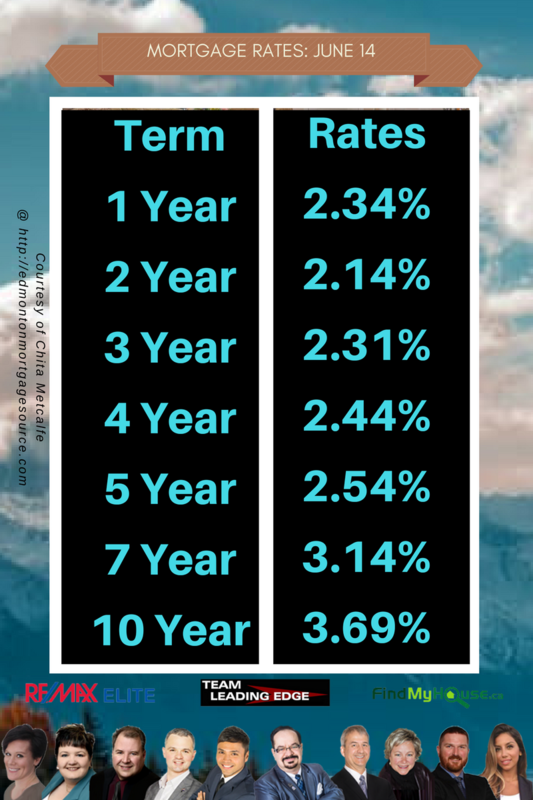 Take advantage of the low rates while it last! Here to help you is Chita Metcalfe of Edmonton Mortgage Source, in financing your home. Monday, December 12th, 2016 at 1:33am. 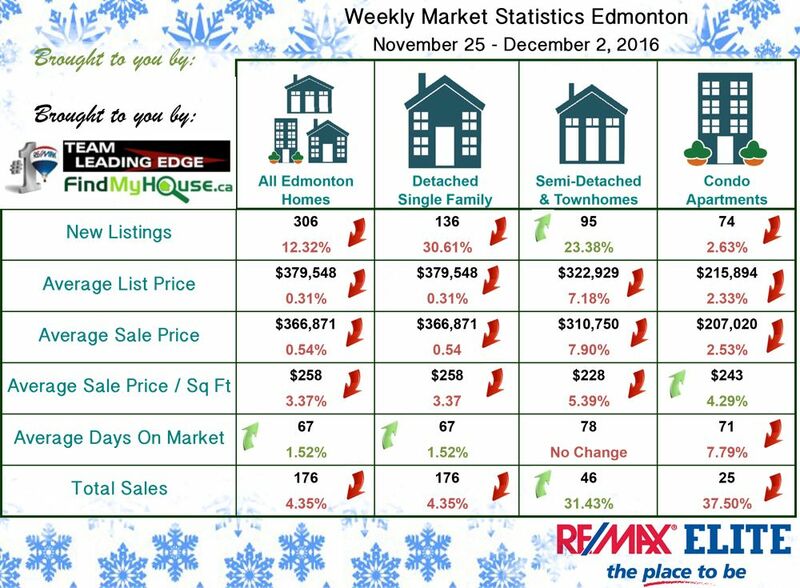 The Edmonton real estate market have greatly improved on the first week of December 2016! If you liked this article follow the team on Twitter at @teamleadingedge. Make sure to subscribe to Team Leading Edge to get newsletters on the Edmonton Real Estate market. Saturday, December 3rd, 2016 at 8:39am. The November 2016 Real Estate Statistics are here! Year over year, inventory, sold homes and etc have all gone up. The average condo price has declined. It is really a mixed bag out there. How do you make sense out of it? It's easy actually! Simply contact us and let's discuss your specific situation. We will provide you with Authoritative and Accurate information so that you can make the best decisions for the market. As always, PLEASE call us and we will be happy to answer any questions that you have or provide you with the information you need. Your home is likely the largest single purchase or sale you will ever make. It makes sense to consult with an EXPERT. That's what we are here for! Saturday, December 3rd, 2016 at 6:25am. The market got crushed last week! 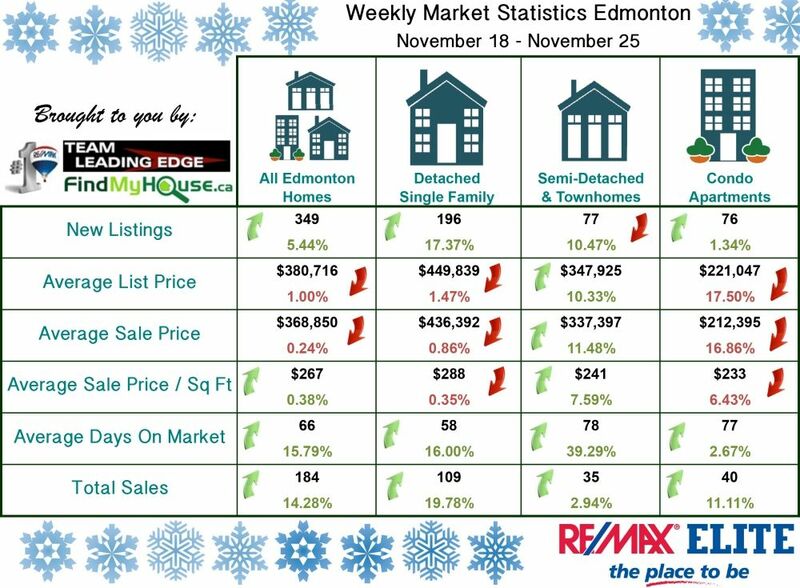 The All Edmonton Homes segment took a nasty downturn with only Average Days On Market clinging in the green territory with a 1.52% increase. New Listings was down 12.32%, while Average List Price fell by .32% followed by Average Sale Price with a .54% decrease. Average Sale Price / Sq Ft was only $258 and Total Sales only reached 176, a 4.35% drop. Saturday, November 26th, 2016 at 9:04pm. Green outscored the Red! 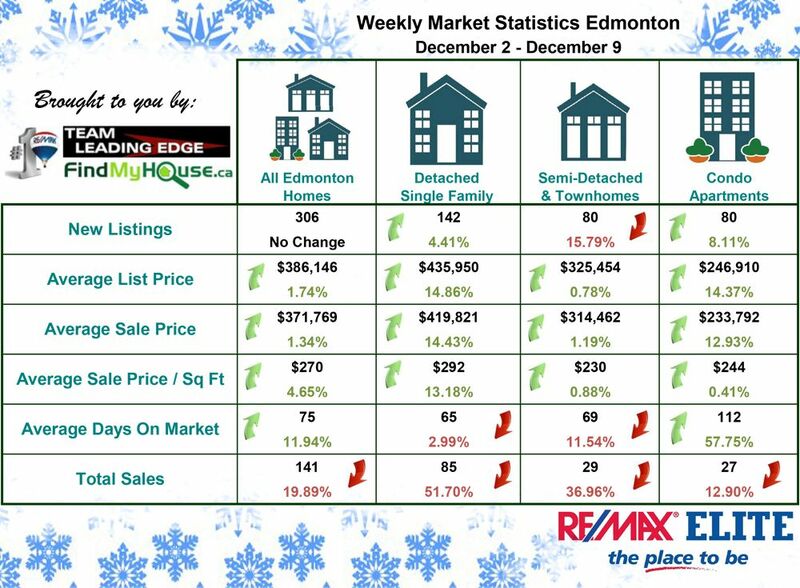 The Edmonton real estate market improved this past week. 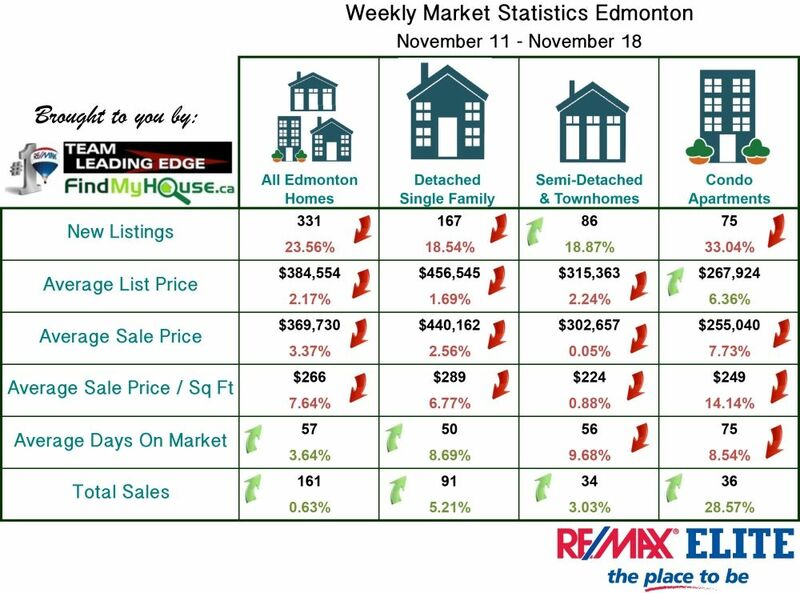 In the All Edmonton Homes segment, New Listings gained a 5.44% increase to reach 349. Average List Price, although it was in the red territory has slightly recovered, falling just 1% vs its 2.17% drop in the week covering Nov 11 - 18 2016. The same thing goes to the Average Sale Price, falling by only .24%, a better prospect than the 3.37% decrease the previous week. Average Sale Price / Sq Ft also recovered, posting a .38% gain. Average Days On Market jumped 15.79% while Total Sales grew to 184, a 14.28% increase. The market is starting to gain traction again, the question now is, would we see the improvements recorded this past week spill over next week? Monday, November 21st, 2016 at 9:06am. Here are the stats for last week. Like a roller coster ride, the market swings up and down and side to side. The week covering Nov 4 to 11, we saw the Condo Apartment segment rolling green across the board, this past week, the Average List Price remained virtually the same, gaining 6.36% vs the Nov 4 to 11 record of 6.42%. Total Sales for the Condo Apartment segment was the big winner out of all the other segments, garnering an impressive 28.57% vs its Nov 4 - 11 stat of only 3.70%. Friday, November 11th, 2016 at 10:30pm. The Condo Apartment segment is on a roll hitting green across the board!